Batangas: Preserve the town plaza of San Jose, Batangas! Here is another attempt by a local government unit to build a structure on a town plaza. As the plaza issue rages in Antequera, Bohol, the Municipal Government of San Jose, Batangas bared plans to construct a new municipal hall on the town plaza itself. And the National Historical Commission of the Philippines has again made clear its position that building on historic town plazas and open spaces is not just prohibited by law, it denies the right of every community to access free, open spaces. Below is a copy of the second letter of the Chairperson Ma. Serena I. Diokno of the National Historical Commission of the Philippines on the issue. 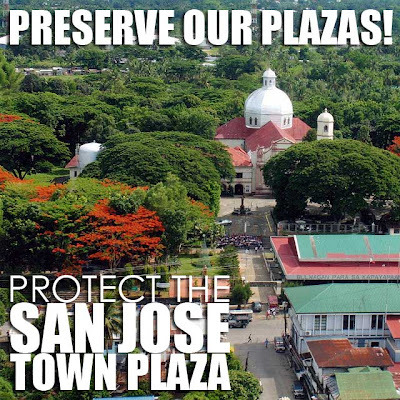 Let's support the citizens of San Jose, Batangas as they unite to protect their historic town plaza. San Jose has a green town plaza with a lot of flowering trees. Surely, the mayor has other places to build his new municipal hall. I wonder what's going on in Batangas and mayors seem to be on a building spree for new muncipal halls. Don't forget to like the Preserve the San Jose, Batangas Town Plaza page on Facebook and spread the world! This refers to the proposed construction of the San Jose Municipal Building within the municipal plaza of San Jose, Batangas. We have already made our position clear on this matter, which is not only known to the public but which many citizens support. One again, we urge the Honorable Mayor to retain the plaza as a free, open space. This is more than a matter of law or technicality. This is a matter of our nation's historical resource that we, as public servants, are bound by duty to preserve. The concept of an open-air town plaza dates back to the 16th century, when various royal ordinances decreed the layout of towns with the plaza right in the center, accessible to all. The plaza was so crucial to the life of the town that the Spanish colonial government stipulated the shape and size of the plaza and the structures that could be built around it, specifying "that no other structure can be built next to them excepting such as... [to] contribute to their commodiousness or beauty" (Hispanic American Historical Review, vol. 5, 1922). Your proposed municipal building will shatter the beauty of the plaza and deny the residents and citizens of San Jose (and others who visit San Jose) access to free, open space - a right they , and future generations, ought to enjoy. For these reasons, I reiterate: the National Historical Commission of the Philippines strongly opposes your plan to put up enclosing structures within the town plaza and is prepared to use the means and resources available to it to keep the plaza open and free. I invite you, Mr. Mayor, to work with us in keeping our heritage and history alive. Note: Aerial photo of the plaza sent by Gracia Ona is by Jun Comia. Plazas are meant to be open and free. It doesn't take a genius to know that. How come they don't understand that? Good News! We have learned that the officials of San Jose is now geared to purchase a lot outside the town proper for the construction of the Hall. But we will still be vigilant. We are encouraging the schools and citizens of San Jose to write a letter to the Mayor & SB on the importance of the town plaza. These are our Town's main features to be proud of: the Malaquing Tubig River, the Church and Convent & Patio, the Municipal Hall and the Town Plaza all here at the Center of the Town properly laid out. Where in the Philippines could they find these? We should properly maintain and clean this up. 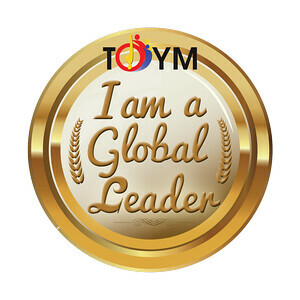 Thank you for all your continues support. Good news indeed. Thanks Ms. G. Ona for campaigning for the preservation of the San Jose's plaza. As well for the vigilance and protest of everyone concerned. Two places that I like (Plaza and all) because of the zoning are Bacolod and Iloilo. You could see how the older towns are developed during the earlier times in the Philippines. I think we should not only preserve Plazas but also old residences,buildings and monuments. 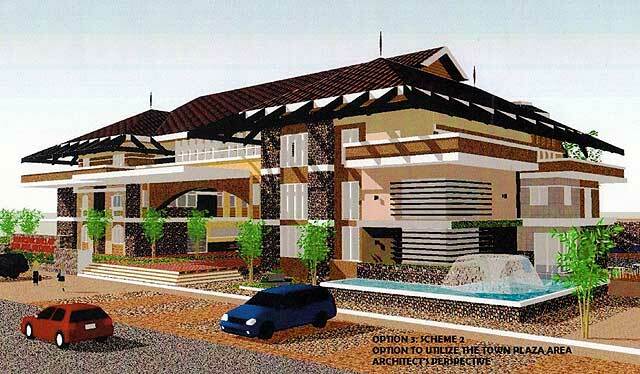 : thank goodness, mayor briones and the local officials, changed their minds. and cheers to gracia ona for being vigilant to protect and save this town. San Jose is one of the oldest municipalities in batangas.heritage is grand. heritage never goes out of style.